we've pickled stuff before here and have been working for months on our own classic dill pickle recipe to share but here are two new pickled things we recently came across. lately we can't get enough vinegar, lemon juice or anything acidic - don't know exactly what this means but the honeycrisp apple kimchi with jowl bacon at momofuku ssam bar we had at dinner a few nights ago was a great way to satisfy our craving! the recipe for spiced pickled beets is adapted from this book and reminds me so much of the pickled beets that found their way onto our dinner plate many nights growing up. the pickled fennel is adapted from an old Food & Wine magazine recipe and we're still trying to figure out how to work it into an ice cold martini recipe! wash the beets and trim the tops, being careful not to cut into the beets. leave roots intact. add the remaining ingredients to a large heavy bottomed stainless steel pan and bring to a boil. reduce to a simmer, cover and simmer 1-2 hours or until beets are tender when pierced with a skewer. left the beets out of the liquid and cool. peel and slice into 1/4-inch slices. pack into a pint jar and top with strained cooking liquid. keep in the refrigerator for up to 2 weeks. in a shallow dish, combine water, vinegar, salt, sugar, cloves and cinnamon and stir. fill a jar with fennel and cover with liquid. refrigerate overnight and serve lightly chilled. Pretty as ever. I adore pickled beets! You know that kind of thing that you know, but just don't remember often? 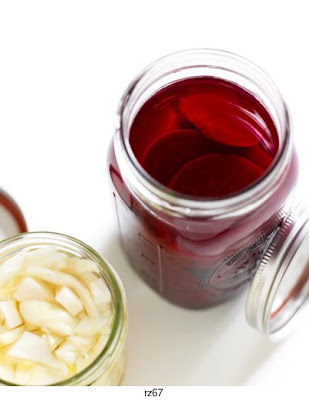 When I read pickled beets it instantly came to mind that my grandmother cooked that a lot for us. Memory + delicious food = I'm making that tonight! I love the idea of peppercorns with pickled beets. I'm going to have to remember that for the next batch I make. Oh man. I have a love affair with pickled beets that no one in my life understands. Stoked to try this recipe out! Oh my, oh my! I can not wait to pickle these beets up. Too bad I finished the beets off from my garden weeks ago. Funnily enough I was talking to someone only today about trying to source pickled beets in St Lucia - not easy... all the time I was salivating at the prospect of pickled beets! And beetroot soup is also a favourite. Love the site by the way!